This is a beautiful antique late Regency jewellery box. It dates back to the reign of William IV, circa 1820/1830. This box has beautiful alternating bands of Rosewood and Satinwood veneers. The lid has an iridescent Mother of Pearl cartouche and there is a complimentary Mother of Pearl escutcheon to the keyhole. 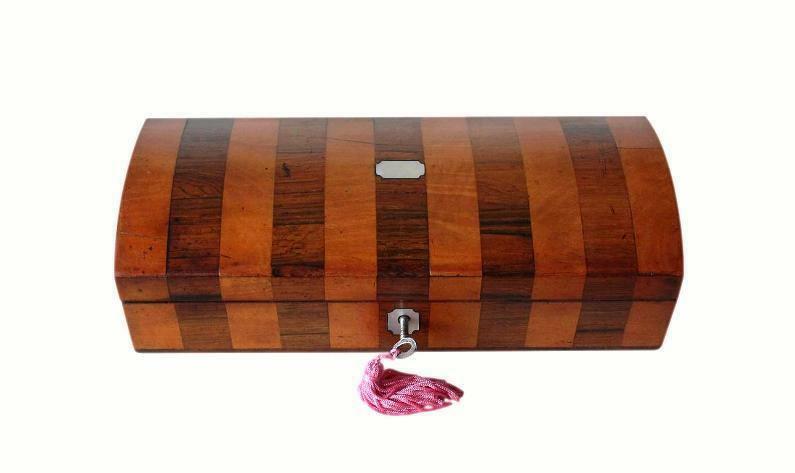 The lid has a beautiful domed shape and the box is complete with its original brass 'stop' hinges. These hold the lid upright. The box also has its original lock and key. 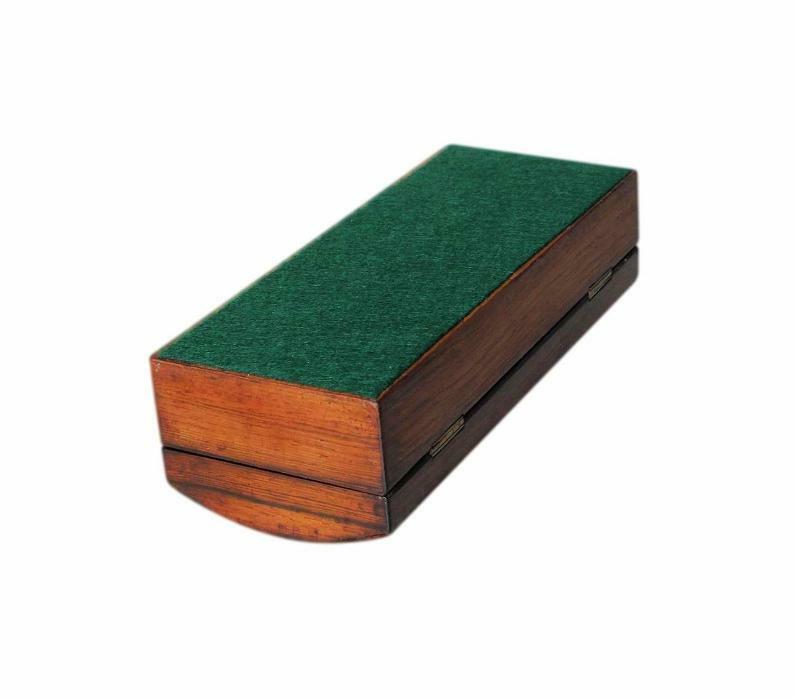 There is a new felt covering on the bottom of the box which will protect the surfaces of furniture. Please note the lock is no longer fully functional and the key is for decorative purposes only. Please do not attempt to lock the box. The base of the compartment has a new padded satin panel and there are new satin linings to the walls of the compartment and the inside of the lid. The satin is a lovely deep crimson red shade. 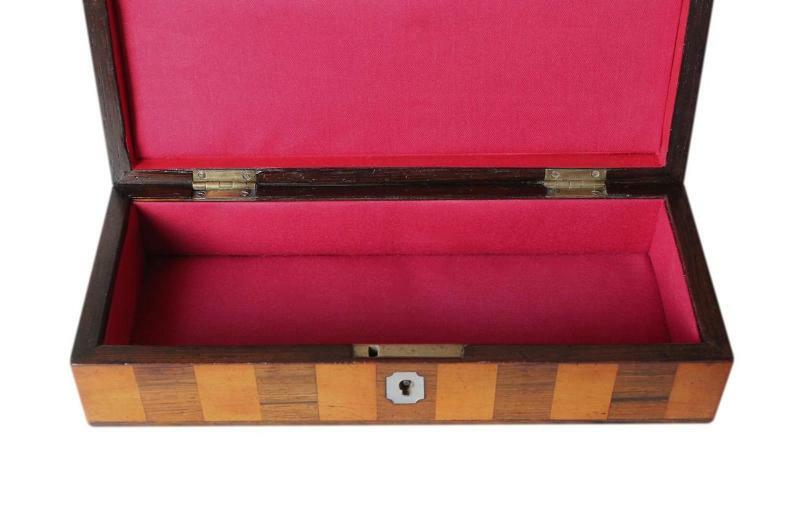 This stylish box started life as a ladies glove box. It would've sat on a dressing table, storing her expensive silk gloves. It is now a functional jewellery box alongside being a wonderful piece of social history. This beautiful box is in very good condition. All of the Mother of Pearl inlay is present and intact. There are superficial fine hairline cracks to the first and last bands of Satinwood veneer on the lid. 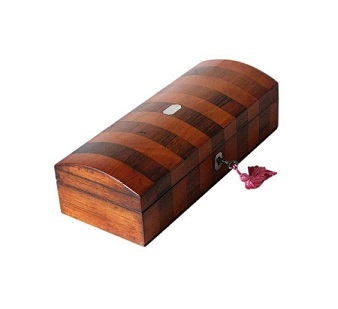 These are not overly noticeable and do not spoil the beautiful overall appearance of the box. The interior satin, being new, is in pristine unused condition. The hinges are still in very good working order. 22.7 by 8.0cm with a 3.4cm depth. International postage is £25. Delivery is fast, within 3-5 working days to Europe and 5-7 working days to the rest of the world. Postage is by Royal Mail International Tracked and/or Signed For.